Be the first to share your favorite memory, photo or story of Madeira Joyce. This memorial page is dedicated for family, friends and future generations to celebrate the life of their loved one. 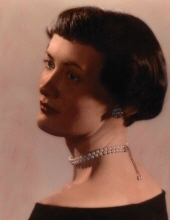 Madeira Joyce DeLoach Thom, 87, went home to be with her Lord and Savior on Wednesday, March 13, 2019 in Fort Worth, TX. .Madeira was born in Hahira, GA on November 28, 1931; the 13th child born to Uriah Jackson DeLoach and Alice Corilla Swindell DeLoach. She loved quilting, gardening, music, dance and travel; as her adventurous spirit took her around the world. Because she was a tenacious entrepreneur she built a successful real estate brokerage that thrived until her retirement. Madeira’s tender heart, infectious sense of humor, and dedication to her family will continue her legacy. She was preceded in death by her parents, four brothers and seven sisters. Madeira leaves behind her son, Charles Steven Exum and wife Jan; daughters, Alyce Marcelena Recatune, Denise Recatune Phillips and husband Steve, Laura Michelle Bowerman and husband Rick; grandchildren, Lauren Martin and husband Brent, Catherine Jones and husband Rodney, Anna Bowerman, Evan Recatune and Stephanie Phillips; great grandchildren, Gracie, Zane and Rhett Jones and Marleigh Polster. Her funeral service will be held on Tuesday, March 19, 2019 at Ebenezer Freewill Baptist Church in Glennville, GA. Visitation beginning at 12:00 pm with service at 1:00 pm with interment to follow in the Church Cemetery. She will be greatly missed by all who love and cherish her memory. To send flowers or a remembrance gift to the family of Madeira Joyce DeLoach Thom, please visit our Tribute Store. "Email Address" would like to share the life celebration of Madeira Joyce DeLoach Thom. Click on the "link" to go to share a favorite memory or leave a condolence message for the family.